Rotary Africa is the magazine read by Rotarians in the approximately 20 countries which form Rotary International’s eight Southern and Eastern African districts. Our magazine is part of the Rotary World Magazine Press and is one of its 31 regional magazines. The regional magazines are read by more than half of the 1.2 million Rotarians worldwide. These publications are produced independently by Rotarians, distributed in more than 130 countries and published in 25 languages. They have a combined circulation of 780 000. Each magazine has a local editorial slant but includes articles and photographs of international Rotary interest from The Rotarian. Rotary Africa has been published since 1927 and is based in the Durban suburb of Westville, South Africa. Our readers hail from Angola, Botswana, Comoro Islands, Djibouti, Ethiopia, Kenya, Lesotho, Madagascar, Malawi, Mauritius, Mozambique, Namibia, Reunion, Seychelles, South Africa, Swaziland, Tanzania, Uganda, Zambia and Zimbabwe. Rotary International is a volunteer organisation with over 33 000 clubs in more than 200 countries and geographical areas and initiates humanitarian projects which address challenges affecting the world today, such as health, hunger, poverty and illiteracy. July 2017 marks the 90th anniversary of Rotary Africa. The magazine, established in 1927, has undergone two name changes and expanded its distribution to include English-speaking Africa. Rotary Africa is published by Rotary In Africa a registered public benefit organisation. 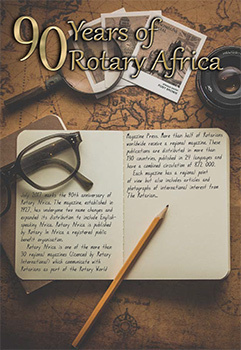 Rotary Africa is one of the more than 30 regional magazines (licenced by Rotary International) which communicate with Rotarians as part of the Rotary World Magazine Press. More than half of Rotarians worldwide receive a regional magazine. These publications are distributed in more than 130 countries, published in 24 languages and have a combined circulation of 872 000.